Update 21/11/17 — The Kigali Amendment will now officially start in January 2019. The required entry-into-force threshold was reached this month after Sweden became the 20th party to sign the agreement on 17 November 2017. Ten other countries also signed the deal this month, including the UK, which ratified it on 14 November 2017. Update 15/10/16 — A deal was agreed by almost 200 countries on 15 October 2016. The agreement means that developed countries will start to limit their use of HFCs by at least 10% from 2019. The complex deal also ensures that many developing countries, such as China and some in South America, will freeze their HFC use from 2024. Other developing nations, such as India, Pakistan, Iran, Iraq and the Gulf states, will not freeze their use until 2028. By the late 2040s, all countries are expected to consume no more than 15-20% of their respective baselines. Countries also agreed to additional funding, but the exact amount will be agreed at the next meeting in Montreal in 2017. This week, countries will gather in Kigali, the capital city of Rwanda, to tackle a small but potent cause of climate change: hydrofluorocarbons (HFCs). The conference is the second in a trio of important UN climate meetings this year. Earlier in October, nations worked on a new aviation deal. In November, they will convene again in Marrakech to build on the Paris Agreement. HFCs are synthetic chemicals used mainly in fridges and air conditioning, but also in fire extinguishers and as solvents. HFCs, like aviation and shipping, were omitted from the Paris Agreement, despite being a potent greenhouse gas. Countries have agreed to tackle them them through the Montreal Protocol instead — a UN treaty better known for tackling the hole in the ozone layer by phasing out chlorofluorocarbons (CFCs). The Montreal Protocol is recognised as one of the UN’s most successful environmental treaties to date. It called for a total phase out of CFCs by 1995 for developed countries and 2010 for developing countries. However, these CFCs had to be replaced by something. At first, this was hydrochlorofluorocarbons (HCFCs) — a group of chemicals that deplete the ozone layer 10 to 50 times less than CFCs, which were considered “transitional substitutes” under the Protocol until ozone-safe replacements could be commercialised. Later, HFCs started to be used instead. The graph below illustrates the rise and fall in the use of these three chemicals. Consumption of CFCs, HCFCs and HFCs, 1950-2010. Source: HFCs: A critical link in protecting climate and the ozone layer (opens pdf), UNEP. Scientists estimate that HFCs in the atmosphere account for 1% of the warming caused by all greenhouse gases, but their usage is on the rise. Consumption is growing at a rate of 10-15% a year, as demand grows for fridges and aircon. One study estimates that, in a business-as-usual scenario, HFCs could rise to 9-19% of projected global emissions by 2050. This is problematic because of their impact on the climate. While emissions are dwarfed against global CO2 emissions, their capacity to warm the atmosphere is stronger. There are several different types of HFCs. The most persistent ones can be several thousand times better at absorbing heat than CO2. Based on the current mix of HFCs being used, their impact is 1,600 times stronger than CO2 per tonne emitted. One study has argued that phasing out HFCs could help to avoid up to 0.5C of warming by the end of the century. Since the Paris Agreement has an aspirational but difficult goal of limiting warming to 1.5C above pre-industrial levels, such a boost could prove vital. What are the options for replacing them? There are already alternatives to HFCs available. These include natural refrigerants, such as hydrocarbons, ammonia and carbon dioxide (which would have a negligible impact in the small quantities released by cooling systems, since it is thousands of times weaker than some of the HFCs currently used). There is also the option to replace the current HFC mix with different HFCs that trap much less heat over their lifespan. There is another group of chemicals available called “unsaturated HFCs”, or HFOs, which are less potent greenhouse gases than the current mix of HFCs. A 2014 study undertaken for the European Commission found that, in developing countries, approximately 90% of HCFCs and highly potent HFCs could be replaced with substances that have a low or moderate warming impact. The world went through a lot of effort in December last year to sign a UN climate deal, so why do HFCs get special treatment? It could be argued that it was the Montreal Protocol that created the HFC problem when it phased out CFCs, so it is the Montreal Protocol that has the responsibility to solve it. However, the Montreal Protocol is not perfect, she adds. So far, the treaty has seen one chemical replaced by another, only for the new chemical to also need phasing out. Instead of phasing in less potent HFCs, this time countries should be able to choose sustainable replacements “and avoid this chemical treadmill”, she says. It is worth noting that HFCs were included in the Kyoto Protocol, but since this only applied to developed nations, its impact on reducing the chemicals was negligible. The idea to tackle HFCs through the Montreal Protocol has existed since at least 2009. However, persuading India and some of the Gulf States to take this approach initially proved difficult. They argued that the issue should be discussed instead at the UN’s climate change body (UNFCCC). For a while, it was a subject of heavy diplomacy. In September 2014, Indian prime minister Narendra Modi and US president Barack Obama agreed on the need to take urgent action on HFCs under the Montreal Protocol. Obama made a similar agreements with the Brazilian president and Pakistani prime minister in 2015. Also in 2015, the EU and China agreed to work with other countries to agree on a solution to tackle HFCs. The effort paid off. On 6 November 2015, nations accepted the Dubai Pathway on Hydrofluorocarbons. This was an agreement to work towards an HFCs amendment of the Montreal Protocol in 2016. This was further discussed at a number of meetings throughout 2016. Now, in Kigali this week, countries are expected to decide upon a final deal. What could happen in Kigali? 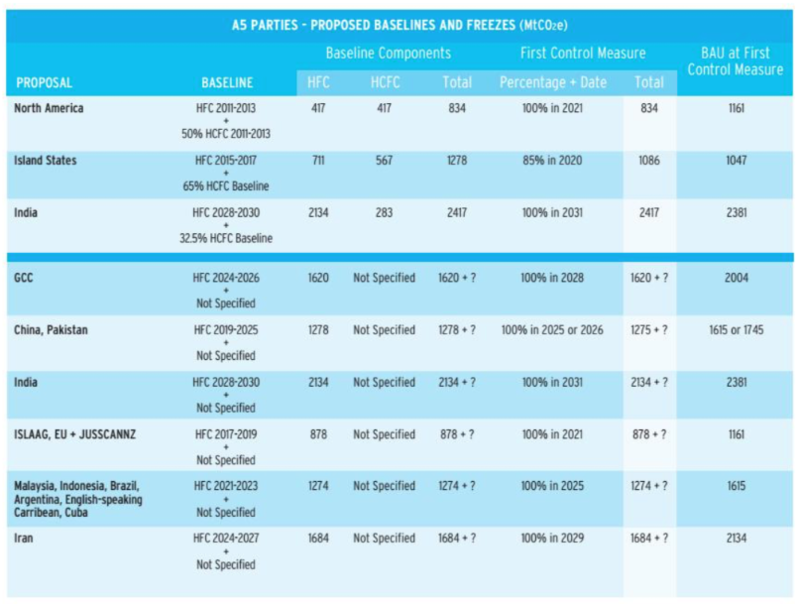 Countries have inched ever closer towards an HFCs deal over the past years, but there are still a number of important issues to be resolved before the meeting concludes on 14 October, which will determine the overall ambition and impact of the final amendment. The question of when the phaseout of HFCs should start is paramount to the discussions. The baseline against which reductions are measured is also important. Various countries and coalitions have already put some proposals on the table. It should be noted that different pathways are proposed for developed and developing countries as a means of recognising their different capabilities. The EIA has produced the following tables summarising the proposals. For instance, the North American proposal is that developed countries should reduce HFCs to 90% of the 2011-2013 average by 2019, and that developing countries should peak HFCs in 2021. All countries would then have to phase down in steps from their starting points. India’s proposal is the outlier in terms of ambition. It suggests that developing countries should only peak HFCs from 2031, with unrestrained growth permitted until this point. In comparison, the island states have proposed cutting developing country emissions to 85% of the 2015-2017 average by 2020. The proposals contain separate targets for an HCFC phaseout. For developing countries, it is important that the freeze date is early, as this will prevent the rapid growth projected in coming years. Since many are currently in the stage of phasing out HCFCs, it would enable them to take advantage of a narrow window of opportunity to leapfrog HFCs altogether, and go straight to a sustainable alternative. How can reluctant countries be brought on board? However, there are various incentives available to developing countries that could take the edge off their burden. By forcing developed countries to take the first steps towards an HFC phase-out, the path will be easier and cheaper by the time developing countries also embark upon it. During this grace period, early action by others is expected to advance the necessary technologies and bring down the price of transitioning to HFC alternatives. The Montreal Protocol also has its own pot of money called the Multilateral Fund, contributed by developed countries, that is used to advance actions in developing countries. Between 2015 and 2017, the fund has a budget of $507.5m. Nations eager to seal the deal have also added their own sweeteners. In September, a group of countries including the US, UK, Germany and the Netherlands pledged an additional $27m to the Multilateral Fund designed to support early action, on the condition that the deal agreed in Kigali actually warrants it. A group of 19 philanthropists simultaneously agreed to provide another $53m to developing countries to support improvements on energy efficiency. GHGs and aerosols | August 8. 2016. GHGs and aerosols | March 3. 2013. GHGs and aerosols | July 7. 2014. GHGs and aerosols | December 12. 2018. GHGs and aerosols | December 12. 2015.